We are proud to announce that Te-Iltcohe Prallo Gwiredd E1676305 is our first home bred permanent champion. Te-Iltcohe Prallo Gwiredd E1676305 is a daughter of Amarillo Sky Apollo and out of Te-Iltcohe Chadar Pravda. She was our 2014 star of the show season with an 8th place at Nationals, 2nd and 3rd placings at the Oklahoma State Fair and the Tri-State Fair and Rodeo in Amarillo, Tx., and Jr. Recorded Grade Grand Championships at the SWMDGA annual Quad Show, Springfield Mo., and the Mo. State Fair, Sedalia, Mo. Continuing in the foot steps of her 2014's tarmac trail , Gwiredd started her 2015 show season with another Jr. Recorded Grade Championship and Best Jr in Show win at the 2015 Tri-County Fair , Mountain Grove, Mo. the Tri-County was a family affair for this lovely Apollo daughter who's dam, Pravda, won the Sr. 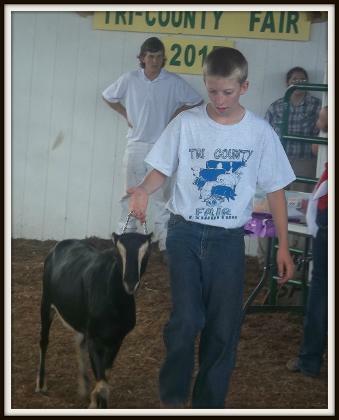 Recorded Grade Champion honors at Tri-County Fair as well. 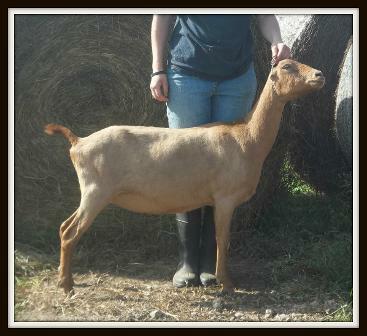 Gwiredd's 2015 show season wins also include 1st place dry yearling doe and Grand Champion Jr. 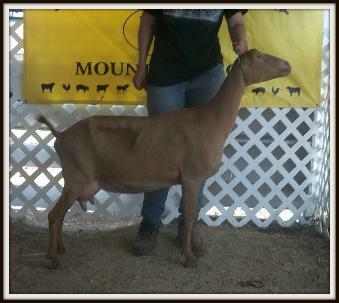 Recorded Grade Doe at the 2015 Heart of the Ozarks Dairy Goat Show held in West Plains, Mo. 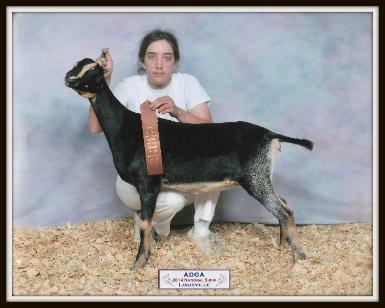 She then went on to win her fifth Jr. Grand Champion placement at the Ozark Empire Fair in Springfield, Mo. . As a Junior doe she never walked into a ring in her home state with out taking a championship. 2017 was another big year for Gwiredd with a Grand Champion win at the Ozark Empire Fair in Springfield, Mo. 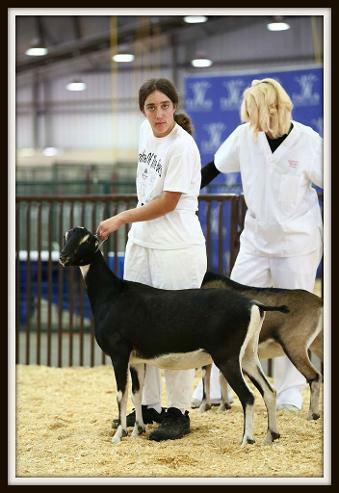 She captured her final leg in 2018 at the Mid-America Goat Show in Sedalia, Mo. 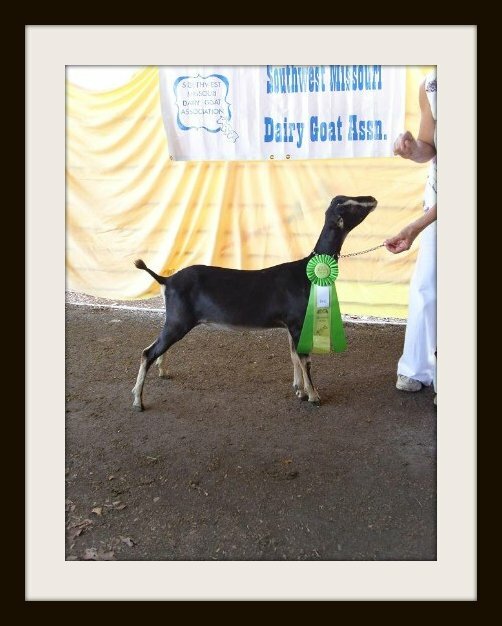 She also captured Reserve Grand Champion Recorded Grade doe at the 2018 Heart of the Ozarks Dairy Goat Show and Missouri State Fair. 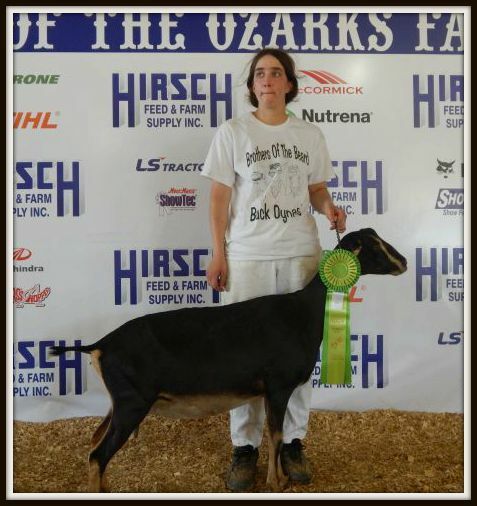 Te-Iltcohe Our Makers Angharad AL1682378 was 1st place Lamancha 4 year old doe at the 2018 Heaart of the Ozarks Dairy Goat Show. Te-Iltcohe Our Makers Angharad AL1682378 made a big splash in her maiden show season for 2015. 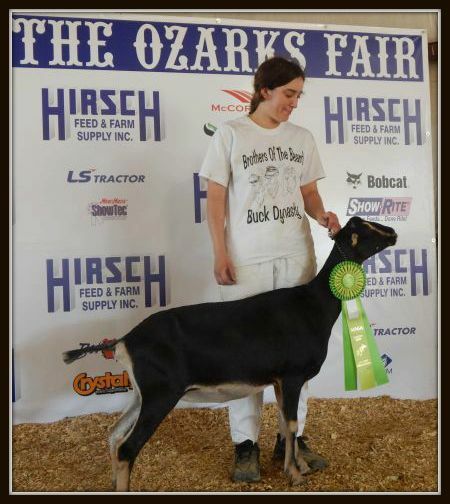 She was Jr. Champion Lamancha at the Tri-County Fair, took two Jr. Reserves and a Jr. Grand Champion Lamancha placing at the SWMDA Quad Show, and a Reserve Jr. Championship at the Heart of the Ozarks Dairy Goat Show. She also won the Jr. Grand Champion Lamancha doe honors at the 2015 Tulsa State Fair on September 30th. Due to a leg injury in 2016 Angharad was not shown again until she made her senior doe debut at the Annual SMDGA Quad Show in Springfield, Mo. where she placed 3rd in all four rings behind Forrest Pride and Worthy Master Farms. 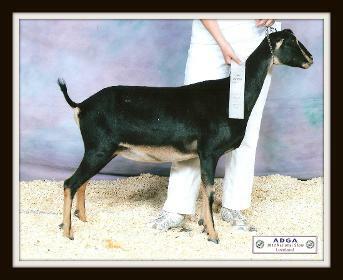 Aeden with her 9th place National ribbon as a yearling. 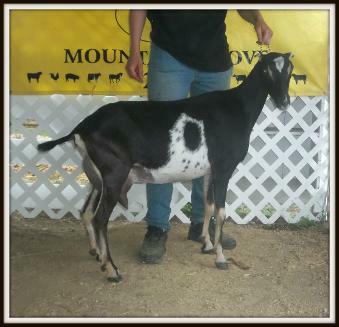 Pictures of does on this page shown at the Heart of the Ozarks Dairy Goat Show are used by permission of the Heart of the Ozarks Dairy Goat Association. Thank you for the use of these photos. Pictured on the left is SHEPHERD'S-GATE PADAH L1258518 whom we consider the grand old dame of our Lamancha and Experimental herd. She was the dam of Pallu and Pravda . Padah was Sr. Champion and Grand Champion Lamancha, as well as Best of Show at the 2009 Douglas County Fair. To the right is a picture of Te-Iltcohe Croesus Merah AL1628447 our 1st place Lamancha dry yearling at the 2014 Tri-State Fair and Rodeo in Amarillo, Tx. She is a daughter of Forrest-Pride TT Croesus and Te-Iltcohe Apollo's Aedan. She is a first generation American Lamancha. Merah began her 2015 show season with a 1st place win in the 2yr old Sr. Lamancha class at the 2015 Tri-County Fair, Mountain Grove, Mo. Never having been shown before, Te-Iltcohe Honey of a Badger made a little splash in her maiden show with a 1st place 4 year old Recorded Grade win at the 2015 Tri-County Fair in Mountain Grove, Mo. She's continued to do her best and was 1st place aged doe as a 7 year old at the 2018 Heart of the Ozark's Dairy Goat Show. Te-Iltcohe Honey of a Badger at 7 years old at the 2018 Heart of the Ozark's Dairy Goat Show. Just a Few More of Our 2018 "Show Girls". 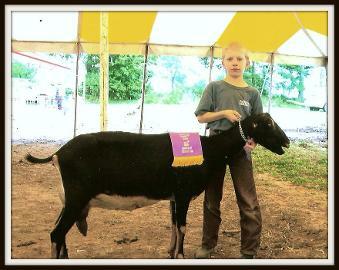 Our 1st place recorded grade dairy herd entry at the Heart of the Ozarks Dairy Goat Show in West Plains. Missouri.